The hills and valleys, and the moments where the two merge, define the Ozarks for us. 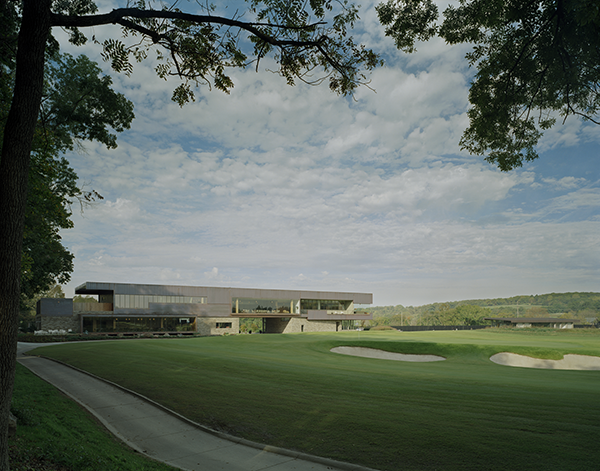 This juncture is where we chose to build the simple, bar-shape clubhouse—from a north-facing slope over an Osage Indian archaeological zone to an artificial hill. 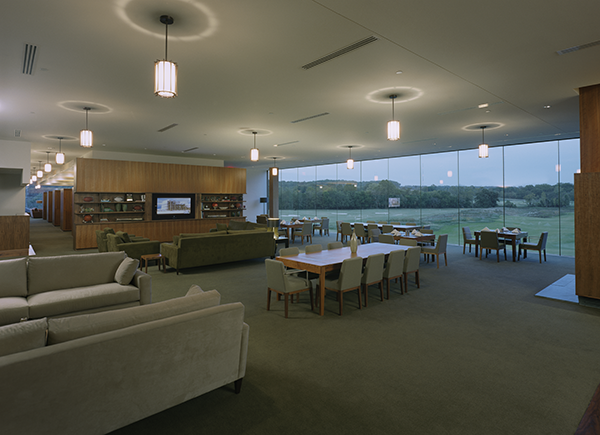 This bridging of two landforms created an entry portal, a breezeway to the main entry of the clubhouse, that frames the eighteenth green, acts as a threshold to the golf course beyond, and is an event space for golf tournaments. 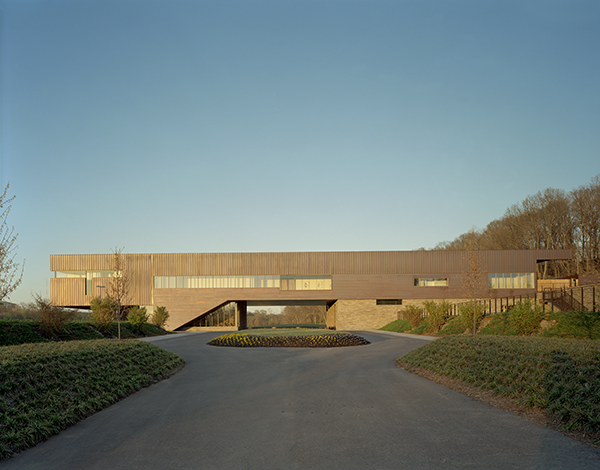 Aligned with its counterpoint, the Razorback Golf Center to the north, the clubhouse has evolved from its initial strategy to become more of a stand-alone structure set at the base of the hill—with its footprint minimally contacting the land, it is, in effect, a covered bridge. Local dry-stacked stone was used to form a strong mass at the base of the clubhouse and at the edge of the cart storage building wall along the swimming pool. 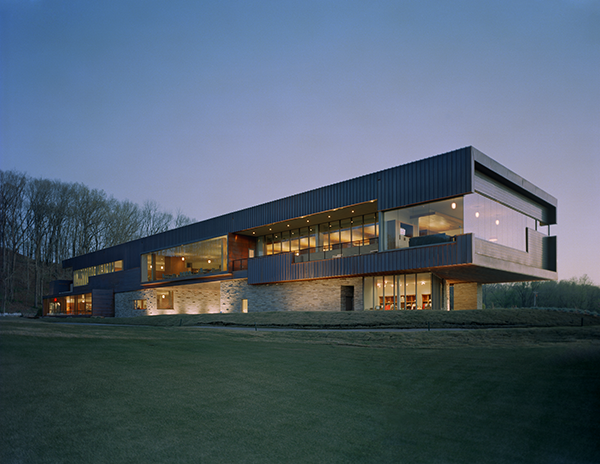 The copper-clad second-story volume sets up views primarily to the golf course through large glass-window walls and porches. Its relationship to its stone base is one of detachment. This structure is an animate form that receives the visitor beneath its cool and shaded underbelly, not unlike the clefts and caves found nearby. 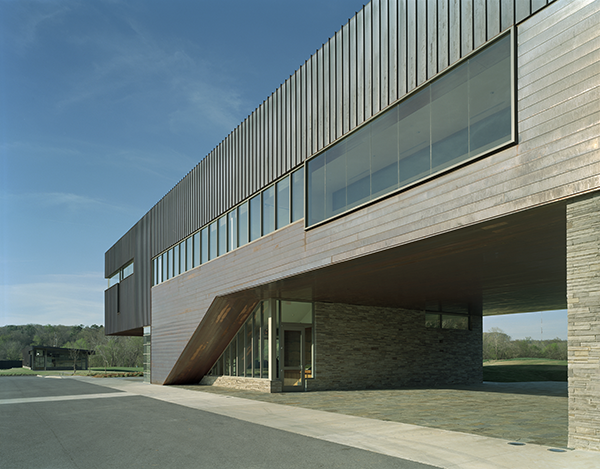 The guardhouse was conceived as a copper-clad beacon to light the vehicle entry and be an iconic figure for the golf community. Its form is a disembodied fragment of a local gambrel-roofed barn. The guardhouse was relocated to the clubhouse entry — redesigned — and scaled to the size of an automobile.